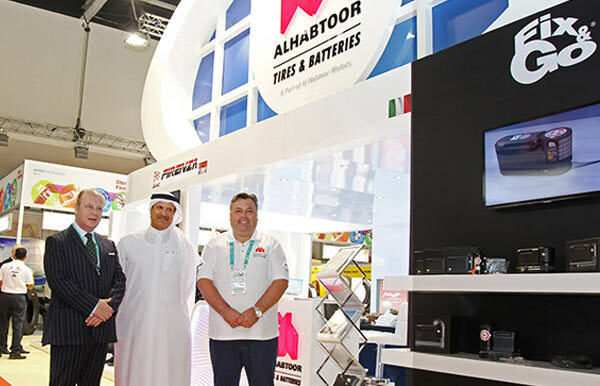 Al Habtoor Motors – Tires & Batteries Division is all set to present its comprehensive line-up of automotive tires, accessories and batteries from world leading brands to the visitors of Automechanika, Dubai in Saeed Hall, stand number S2-140 from 3rd – 5th June 2014 . The event is the region’s largest and most comprehensive trade and networking exhibition for the automotive aftermarket. The Al Habtoor Motors – Tires & Batteries Division is the exclusive official distributor for Sumo Firenza and Avon Tyres in the GCC, and General Tires in the UAE. Recently, the division added Mastercraft to its growing portfolio of tire brands as the exclusive distributor of the brand in the GCC except Kuwait & UAE. Part of Continental Tires, General Tires is originally from the USA. Based on a 100-year old American Heritage, the brand has proven its ability to compete time and again in the ever changing tire industry with manufacturing and technological advancements. Avon Tyres has been making high quality tires since 1904, and has an impressive presence in the UK and rest of Europe. Over the years, Avon has not only proven itself on the road but also on the race tracks of the world. Today, Avon’s century of tire-making experience is combined with the very latest design and manufacturing technology. Since 1909, Mastercraft Tires has earned a reputation for building high mileage tires and 100 years later continues to build car tires to today’s highest American quality standards. Guided by its corner stone philosophy of quality, dependability and evolution, Sumo Firenza from Singapore is a premium budget tire brand that has evolved into a global brand. During the past decade Sumo Firenza has steadily evolved into a growing brand that is well respected within the industry. Apart from tires, the division is the world’s only exclusive dealer for Fix & Go in the GCC and Energizer® batteries in the UAE. Fix&Go Tire Puncture Repair Kits from Italy are manufactured by TEK Group. Fix&Go brings a new safety concept for every man, woman and child across the world and allows the repair of a flat tire on the roadside without using a spare tire in 5 minutes as compared to 45 minutes for the conventional spare tire change. Fix & Go comes with a 2 years warranty along with a 5 years shelf life for the sealant. Fix & Go is fitted standard as OEM to 24 manufacturers worldwide. Energizer®premium vehicle batteries from USA is a world leader in automotive batteries. Part of Johnson Controls Group, Energizer® batteries use PowerFrame® Grid Technology for more consistent power. It provides reliable starting power thanks to its streamlined range of batteries which boasts top European quality, performance and reliability and for the first time in the UAE Energizer are now offering 18 months warranty on all passenger and commercial batteries. The Al Habtoor Motors Tires & Batteries Division currently offers customers a Free Vehicle Health Check & One Shot AC Treatment on the purchase of 2 General Tires. The One Shot AC Treatment kills germs and bacteria, deep cleanses the airways and restores fresh as new interior cabin with lemon, strawberry & apple fragrance. Furthermore, customers who purchase 4 General Tires get a Free Car Wash, Body Wax Polishing, Vacuum & Full Compound Body Polish, Body Shine Polishing, Engine Bay De-Greasing, RIM Cleaning and Tire Polishing. “As the authorized dealer for some of the world’s top automotive brands in the UAE, we have a long association with automotive customers and fully understand their needs for quality replacements in their vehicles. We have chosen some of the finest names from around the world in automotive ancillary products like tires and batteries so that our customers get the best options at the most competitive prices. Coupled with the best promotional offers they get an unbeatable value for their money.” said Mr. Neil Coolledge, Head of Tires & Batteries Division and General Manager of SpeedFit.